Nearly 7% of Americans will be diagnosed with posttraumatic stress (PTSD) at some point during their lives. In any given year, 3.5% of Americans have PTSD. Many struggle with sleep problems such as insomnia, sleeping too much, and nightmares. 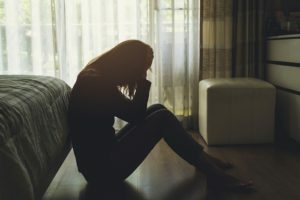 For people struggling with trauma during the day, nighttime can feel like a battleground that offers little respite from traumatic memories and intrusive thoughts. Are Sleep Problems a Symptom of PTSD? For some people, other symptoms of arousal play a role in sleep problems. For instance, a person who is anxious and hypervigilant may be too afraid to fall asleep, while a person with a heightened startle response may startle awake at every sound as they drift off to sleep. This change in sleep can also exacerbate other PTSD symptoms. A chronically exhausted person may be more irritable or have greater difficulty concentrating. Some research suggests that sleep problems are more than just a symptom of PTSD. Instead, they may be a core component of the diagnosis. Research published in 1989 suggests that disturbances in rapid eye movement (REM) sleep are a PTSD hallmark that play a key role in other PTSD symptoms. Subsequent research has yielded mixed results. While some studies, including of animals, find a pattern of REM disturbances associated with PTSD, others do not. A 2013 review of the literature argues that disturbances in sleep, especially REM sleep, may increase the risk of PTSD. Sleep issues may also worsen outcomes in people with PTSD. The study further argues that sleep issues can decrease the effectiveness of many PTSD treatments and that targeted treatments for sleep issues may speed recovery. Being unable to fall asleep because of anxiety or agitation. Difficulty staying asleep because of frequent nightmares. Poor quality sleep because of nightmares. Some people report waking up many times each night and struggling to fall back asleep each time. This is called maintenance insomnia. Sleep problems related to drugs or alcohol. Some people with PTSD use alcohol or drugs to cope, which can cause sleep problems. Some medications for PTSD and anxiety may also cause sleep problems. For example, benzodiazepines may make it difficult to wake up in the morning. More repetitive nightmares in people with PTSD. People with PTSD were more likely to say their nightmares made it difficult to go back to sleep. More anxiety during the day in people with PTSD. More fatigue during the day among people with PTSD. This suggests a feedback loop between sleep issues and other PTSD symptoms. Sleep problems can intensify daytime PTSD symptoms, which may make it even more difficult to sleep at night. People who feel anxious or fatigued during the day may ruminate more on their traumatic memories, increasing the risk of nightmares and other issues when they try to sleep. Sleep problems can intensify daytime PTSD symptoms, which may make it even more difficult to sleep at night. People who feel anxious or fatigued during the day may ruminate more on their traumatic memories, increasing the risk of nightmares and other issues when they try to sleep. Shift work sleep disorder, a condition that alters the “internal clock” of people who work nights or unusual hours. Sleep apnea, a disorder that affects breathing during sleep, causing people to briefly wake many times during the night. Sleep behavior disorder, which causes people to do unusual things while sleeping, such as sleepwalking, driving, or eating. People with PTSD who have a pre-existing sleep disorder may find their symptoms get worse following a traumatic experience. Conditions that affect sleep can also compound the effects of PTSD, leading to depression, anger, difficulty concentrating, and more trouble coping with PTSD symptoms. Even when the symptoms of a sleep disorder are not directly related to PTSD, it’s important to get help. Getting quality sleep is an important component of PTSD self-care. Design a comfortable sleeping area, with a firm and supportive mattress and comfortable pillow. Stick to the same sleep schedule every day, even on weekends or vacations. Avoid napping during the day if you have trouble sleeping at night. Exercise every day, but not right before bed. Keep your bedroom cool, between 60-67 degrees Fahrenheit. Keep your bedroom quiet. Some people find that a white noise machine helps. If you can’t fall asleep, get up and do something else. Use your bed only for sleeping—not to play, read, or do work. Eat a light snack 45 minutes before bed if you tend to wake up hungry. Avoid heavy meals, alcohol, caffeine, and cigarettes before bed. Some people find drinking caffeine in the afternoon makes it harder to sleep. Stress and anxiety management strategies can be especially helpful for managing PTSD-related sleep problems. Some people find relief from meditation or yoga. Others find that guided imagery or positive mantras as they try to sleep can help. Medications, including anti-anxiety and sleeping medications, may help some people. However, when the underlying PTSD symptoms remain, sleep problems will likely return when you stop using medication. Therapy can help with both sleep issues and PTSD. A compassionate therapist will help you work through your trauma in a safe space, free of judgment. Your therapist can help you set goals, cultivate new tools for managing stress, help you understand how trauma changes the brain, and work with your doctor to decide which, if any, medications are appropriate. PTSD can feel overwhelming. Some people become depressed because they think things will never change. Others are too exhausted to work or enjoy time with their family. It doesn’t have to be this way. Reach out to a therapist who is highly skilled at treating PTSD.